Great little set for a great price. 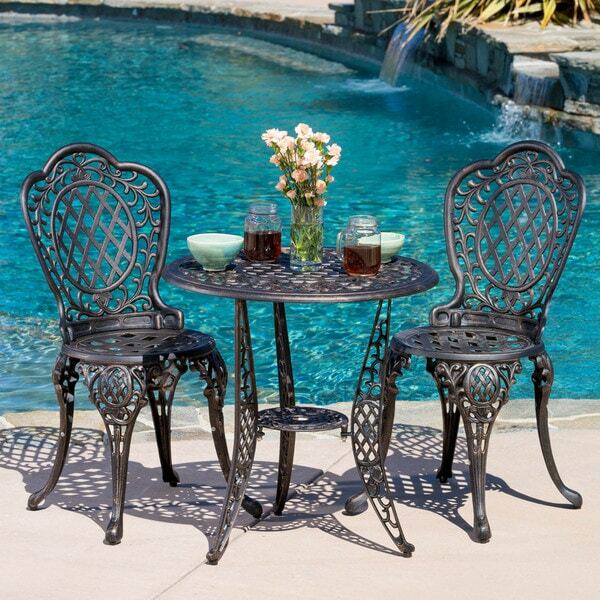 Adorn your poolside or patio with this intricate outdoor bistro set by Christopher Knight Home. Carefully cast for exquisite detail in an intricate lacework design, these aluminum chairs are light yet resilient. The diamond-top design on the table further reduces weight for ease of repositioning. The aluminum construction of this set resists weathering and other outdoor hazards, so it offers years of refined elegance, and a subtle bronzed finish marries well with most outdoor design choices. As well as offering a great place to sit and eat, the set also gives you the chance to protect yourself from the sun in comfort thanks to the built-in umbrella hole. This bistro set is very cute, not really good for a large person but it looks nice and cups sit nicely on top. I have an umbrella in the center hole, I had a hard time finding a base that would fit under the table but I found one and so far it works just fine. I was worried that the table top might be bumpy and things would not be stable. I have kept it covered and I uncover it when I need it. So far and with proper care it should last a few years hopefully! Beautiful set and we are pleased. It was easy to assemble and well packaged. The thickness of the aluminum wasn't as thick as some I have seen. Overall a very good value. This set arrived in the time frame it was promised and was very well packaged. It was easy to assemble and even included the tool for assembly. The seats are surprisingly comfortable for a metal chair. The finish on all three pieces is beautiful. The set looks great in our small court yard. The chair and table are very easy to assemble. The chair and table have withheld even the strongest wind and maintained its charm. Absolutely love the look of this set. Chairs little small and one leg is small. This item is not good for outside if it rains, or in the sun it's not a keeper. Beautiful Bistro set and very well made. Looks really expensive and the detail with all of the different designs really make this set stand out among the others. The price was very good also. Very easy to put together as everything fit nicely. We were amazed at the quality of this set. It is very sturdy. It even has levelers on the bottoms of the table and chairs! We love it. Love it. Exactly what we were looking for. Looks more substantial then some of other outdoor bistro sets. I have a small outdoor space and this bistro set fits perfectly! I like the style with the bronzing! It was easy to put together, and came with extra pieces!! All in all it is a great value!! Pretty, but too flimsy. Returned. Not like the good ole cast iron sets... which you would pay more for. But this set is more for decoration or children seating. This set is very decorative. The price is great but not practical for average and large adults. This is a nice looking set that will last so long as your guest or you weighs less than 150 lbs. I am 180 lbs and the legs of the chair flexes like crazy. The table is not sturdy and everything is bolt on. You get what you pay for. I have got many compliments on this set, and I love the look. It is easy to assemble. It is not that sturdy though...I would be weary of anyone over 150 lbs sitting on the chairs. For my needs, okay though. The price was right. Hard to assemble but great look. We absolutely love this set! Sturdy, nice quality, and very attractive! The price was terrific as well and is worth every penny. We purchased red seat pads and it added that perfect pop of color and makes it even more inviting. You get what you pay for. It’s not an expensive piece so I don’t recommend It if your looking for comfort. It’s not the most sturdy but it will last. It’s never rusted which is a plus! Fit for a king and his queen, early morning coffee and afternoon tea on the deck. Beautiful peace perfect at front porch. "Would I be able to choice the date i need the item deliver am away from home most of the time thank you." "What size of umbrella height and width pairs with this set?" "Do you carry round cushions for these bistro chairs?" The bistro chair will accommodate a round 13.5 inch cushion. Unfortunately, we do not have them in stock. "What size nut holds the backs of the chairs onto the seat?" I like the pattern and victorian look. "Can this Cast aluminum be painted?" Hello nonstop, cast aluminum can be painted. Thank you for shopping with us. "This set is what I'm looking for, but I need it in white. Do you have that option?"